The United States Olympic Basketball Team was announced on Saturday night by USA Basketball chairman Jerry Colangelo. The 12-man roster was selected after Olympic Team training sessions held in Las Vegas. Three final spots opened up after injuries in recent months to at least four top American players. Dwight Howard, Derrick Rose, Dwyane Wade and Chris Bosh all have had injuries that forced them to withdraw from consideration. The Sixers' Andre Iguodala, Blake Griffin (Los Angeles Clippers), and James Harden (Oklahoma City Thunder) all made the team to complete the roster and fill the 3 final spots. They beat out Eric Gordon, Rudy Gay, and the recent No. 1 draft pick Anthony Davis who could not scrimmage because of a sprained ankle. The rest of the players nominated for the team are: Carmelo Anthony (New York Knicks); Kobe Bryant (Los Angeles Lakers); Tyson Chandler (New York Knicks); Kevin Durant (Oklahoma City Thunder); LeBron James (Miami Heat); Kevin Love (Minnesota Timberwolves); Chris Paul (Los Angeles Clippers); Russell Westbrook (Oklahoma City Thunder); and Deron Williams (Brooklyn Nets). 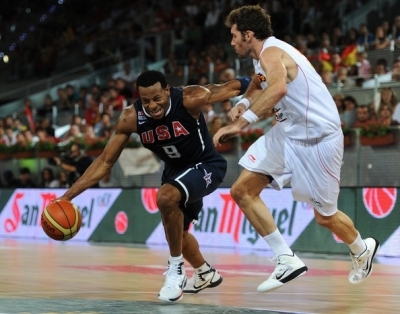 Five of those players (Anthony, Bryant, James, Paul and Williams) won gold in Bejing in 2008. Five of those were members (Chandler, Durant, Iguodala, Love and Westbrook) of the 2010 World. Championship team. Griffen and Harden are newcomers. The 2012 USA coaching staff includes Duke University coach Mike Krzyzewski, who has led the USA Basketball Men's National Team to gold medals at the 2010 FIBA World Championship and 2008 Beijing Olympics. Assisting Krzyzewski is Syracuse University coach Jim Boeheim, and former NBA head coaches Mike D'Antoni and Nate McMillan.